In a just world, Stalcup’s name should be included amongst the new breed of artists including Isbell, Simpson and Stapleton who are marrying tradition and truth. 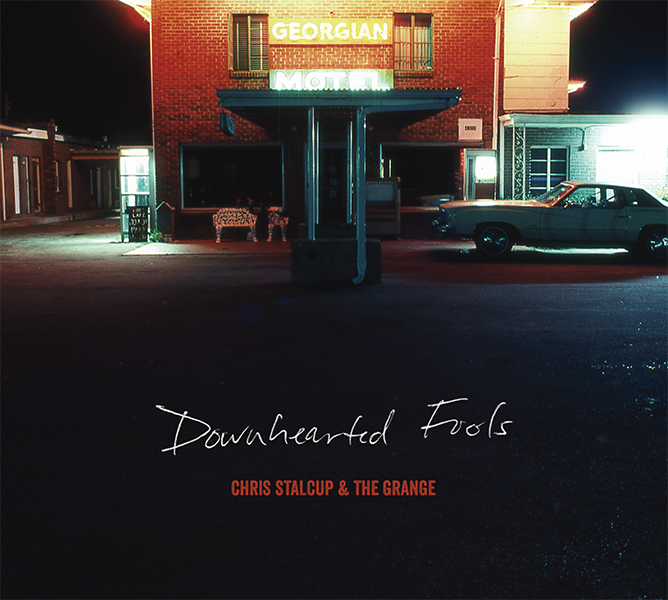 “Downhearted Fools” is a ragged rocker that burns with electricity and hard charging vocals that echoes the Drive by Truckers at their most “Saturday night.” Stalcup offers a set of well worn pipes that speak years beyond his album count, giving the artist a sense of integrity and poignancy. Passion meets purpose—it’s a good way to describe the essence of what’s driving Chris Stalcup and the Grange’s sophomore record Downhearted Fools. Theirs is a sound like a bonfire raging behind some small-town dirt-road shanty, of a band valiantly laying bare its soul while everyone dances wildly, moonshine drunk in the Southern night. Stalcup and his band channel Gram Parsons-influenced Stones tunes like “Honky-Tonk Women” and “Wild Horses,” occasionally coming off like a collaboration between Son Volt’s Jay Farrar and Drive-By Truckers’ Mike Cooley. The songs are deeply authentic and unapologetically Southern. Stalcup’s stint with his old band Chase Fifty Six, and his debut solo record, Dixie Electric Company, led the hard-charging singer/songwriter to open shows for artists like Lucero and Shooter Jennings, piquing the interest of the Americana press, from No Depression and Nine Bullets to Routes & Branches and Bucket Full of Nails. But even through these successful projects, Stalcup had only one foot in music, and the other planted safely in a two-decade spanning career in advertising. But as he began to write the songs that would become Downhearted Fools, he took a leap of rock & roll faith. “I’ve always been taught to follow a more traditional work ethic,” he continues, “to put my nose to the grindstone and work hard at a job. So it was a shock to my system, and those close to me, when I struck out on this new path.” It’s a move that took guts. And—coupled with his new life on the road—it has been a driving force inspiring the new album. It’s also important to frame Downhearted Fools in the context of a failed relationship (a recent casualty of his new life on the road), of Stalcup losing his beloved canine companion of 14 years, and of chalking up his third year of sobriety. As you can imagine, the internal angst and struggle led to a flurry of new songs, written on the go whenever the spirit moved him. Instead of falling back on old habits and cutting and running for the bottle, Stalcup faced the music. Literally. He turned challenges and obstacles and heartache into something positive, the band working through his new songs at soundcheck and in front of packed barrooms on tour. And he tracked them the very same way—live, raw and spontaneous—while working on Downhearted Fools with producer and engineer Ben Price (Little Tybee, Hello Ocho, Faun and a Pan Flute, Book of Colors) and producer Bret Hartley (Sugarland, Eliot Bronson, Sonia Leigh). Listening to the record, it’s as if you’re hearing Stalcup and the Grange from the front row of a smoky dive bar, kickin’ and gouging in the mud, blood and beer—the band is tight, the songs are real, and Stalcup’s potent yet wounded drawl reaches out, grabs you, and pulls you along for the ride.